Yes, if you haven’t been living under a rock for the past couple of years, you know that CRM (Customer Relationship Management) is a ‘must have’ tool. However, when most people think of CRM, their mind immediately correlates it with sales. Although CRM is fundamentally a sales tool, it is no longer just for sales teams. As sales and marketing become more connected, so does a marketer’s use for CRM. Let’s explore. What does a CRM hold that every marketer needs? Yes, contact data, valuable customer insights. Marketers use this data to personalize and target all of their communication. Without a CRM to organize this data, it would be very difficult to segment any contact database. Any functional CRM has the ability to create custom user-defined fields such as, Title, Interests, Industry, Favorite Color, Favorite Sport, and so on. Sales people often use this information to build deeper relationships with their clients and tailor their pitches. Marketers can use this information to send these contacts relevant content to help re-engage and push them through the funnel. Automation is a beautiful thing and CRM can help. If a lead becomes a paid client or has a low lead score, this change in the CRM can trigger automated actions like a re-engagement campaign or a new onboarding drip series. Having a CRM, full of rich customer data can help you improve your conversions and overall ROI. It’s nearly impossible to keep up with every lead turning into a prospect into a paying customer. As your contact moves down your funnel, you need to provide them with different marketing messages. Automation helps you manage your lead nurturing process so you can close more deals and make more money. Great marketing is all about giving the customer a great experience from start to finish. This includes your follow up. I am not talking sales follow ups, but marketing messages sent out when a customer performs a specific activity. For example, a Facebook comment made by a client should trigger a workflow for the social media manager to respond to that post immediately. Marketers can also setup workflows to assist sales by delivering timely and relevant messages based on the information the sales person puts into the contact record. These sorts of messages can significantly help drive that lead down the sales funnel. The second use for timely follow up includes the transition of a lead from marketing qualified to sales qualified. When a lead hits a certain/pre-defined lead score, they can automatically be passed to the sales force for a live demo, meeting, etc. Instead of this being a manual and tedious process where qualified leads slip through the cracks, you become more efficient and on target as they move through the funnel. 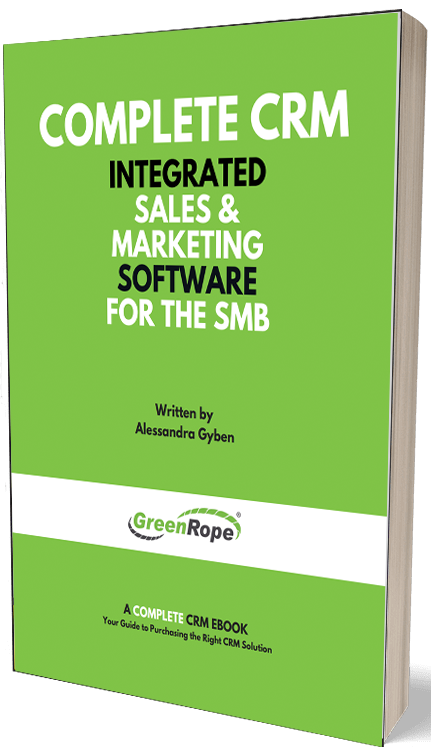 Having a CRM integrated with your marketing allows you to see which of your contacts are opening emails, what websites they are visiting, webinars attended and so forth. You can’t improve your marketing without these metrics. As marketers, we must understand the sales cycle and how our work fits into it. Sales cannot live without marketing and marketing cannot live without sales. A CRM gives us valuable insight into how clients and leads respond to our efforts, so we can determine the best strategy for optimal conversion rates. Personal touches make all the difference for a successful marketing strategy. I recommend using a CRM so you have the data you need to effectively personalize your marketing messages. Whoever thought CRM was just for sales, well, think again. CRM is a power marketing tool and one that we should all be putting into play.